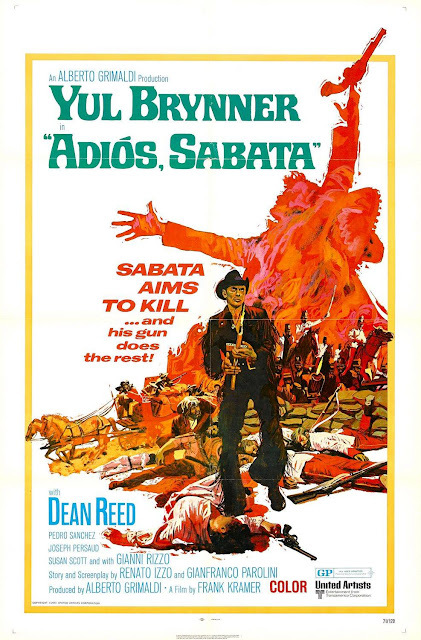 Adiós, Sabata (1970) was originally a film called Indio Black, Sai Che Ti Dico: Sei Un Gran Figlio Di... (which translates to Indio Black, You Know What I'm Going To Tell You: You're A Big Son Of A...) but the name was changed in America to cash in on the success of director Gianfranco Parolini's film from the year before, Sabata. This explains why lead Yul Brynner doesn't wear the same outfit or have the same mannerisms as the character from the first film, but he brings his own charismatic flair and swagger. In an interesting bit of lead actor swapping, Lee Van Cleef (the original Sabata) was unavailable for this film but would later play Chris Adams in The Magnificent Seven Ride! (1972) (the fourth and final film in the series), the role that Brynner made famous in the first two films. This second "Sabata" film isn't as good as the first, but it's a competently made, fun, humorous Italian Western with a good score by one of the genre's greatest composer/conductors, Bruno Nicolai.